I totally had an ahh haa moment this week. I can't keep it to myself. It's just too good. You know, one of those things that you want to shout from the rooftops because its pure awesomeness. Yes. That. So, those of you that know me (ahem: in real life) and have been to my house know that the biggest thing that I would change if I could go back to when we were creating this awesome storybook cottage, it would definitely be that I would have NEVER, NEVER EVER EVER chosen white tile and grout for the master bathroom. Yeah yeah, I should have known better, especially since my dad warned me but hey, we learn the hard way right?! BLECK! Yes, bleck. Not fun. I have tried, oh how I have tried. Ask my husband, I even began thinking of how to talk him into ripping up this white and changing it. 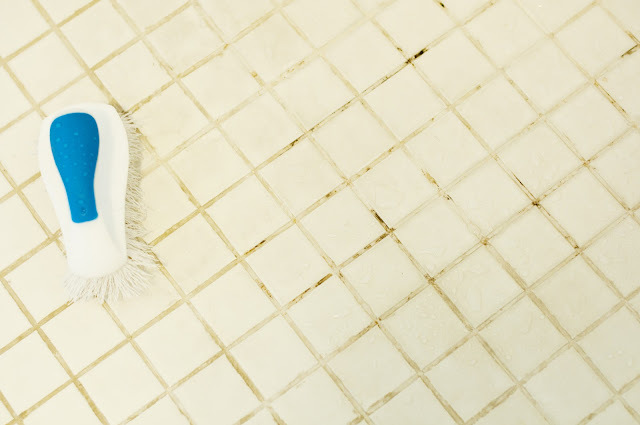 It is that one thorn in my side, the one thing in my house that makes me cringe. I have tried Clorox. I have asked the professionals that clean houses for a living. I've done what they have suggested and opened the windows, while coughing out the fumes and afterwards had to coat my hands in lotion because the chemicals were not loved by my skin. It was horrendous. It didn't work. And, to be totally honest, had me in tears a few times. 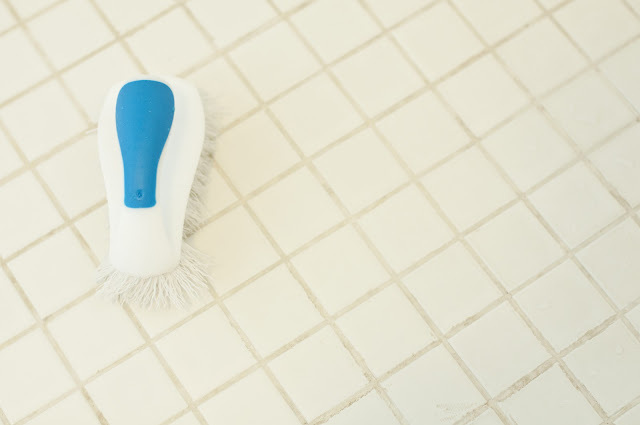 I am thrilled to announce that I have stumbled on a magical solution that not only solves my tile issues BUT also has me giddy about cleaning my entire house. Yes, I'm literally walking around with a spray bottle in hand, and WITH a smile. Want to know the secret to how I said goodbye to Clorox?! I said HELLO to tea tree oil. I've only recently began to experiment with essential oils but I am finding them to be magic. (I think I've said magic like three times already but as one friend once said, it's Magical Monday). 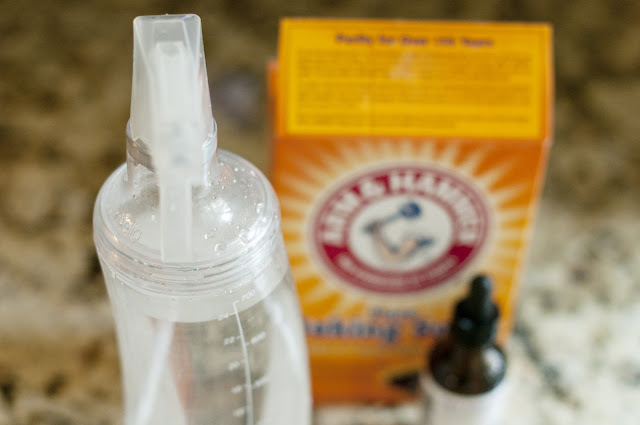 I mix my secret ingredients (baking soda, water and tea tree oil) up in my big 24 ounce spray bottle and then pour it into smaller spray bottles and keep one upstairs and one downstairs. I fill my 24 ounce bottle with warm water. and 3 drops of tea tree oil. Give it a little shake and you are good to go. PLUS: This makes the entire bathroom smell amazing! If you aren't familiar with tea tree oil, you can read more about it here. It's a great germ fighter, something I'm keeping close during this crazy flu season. 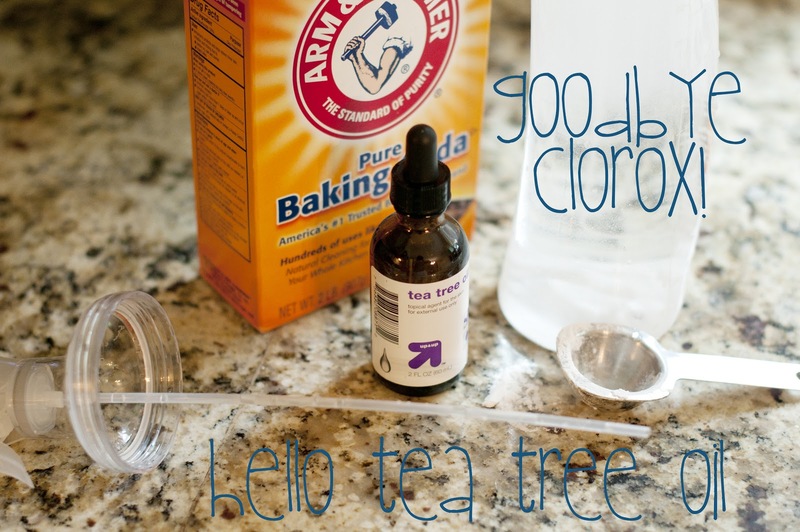 We use tea tree oil for SO many other things too. I plan on adding more of those recipes in the future. Recipes for things like our Tea Tree Oil Salve that we use instead of Neosporin, our Tea Tree Oil ear ache remedy and even my special Tea Tree Oil hair conditioner! Wow thanks for the recipe! we have white tile in our bathroom. This is a rental and I have learned I will never put white tile in a bathroom. Excellent wеbsite. Ρlenty of helρful info here. ans alsο ѕharing in dеlісious. And certainly, thanκѕ on уоuг effort!